The best cotton canvas bags are still better than plastic bags, which produce 80% less solid waste and require 40% less energy to produce. 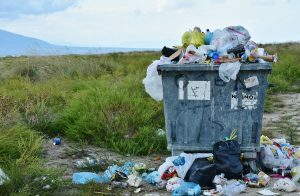 Statistics tell us that the average American family uses 1,500 plastic bags per year, America alone uses 12 million barrels of oil to produce 100 million plastic bags. Our shopping habits are a problem. And more than half of the plastic will make its way into the world’s oceans. If you want to stop being part of the problem and start being part of the solution, you can make one simple change: canvas totes. Eco-friendly bags allow you to continue reusing the bag, wash them and lower your footprint on the planet. And at such a cheap price, you’ll wonder why you didn’t invest in your tote or bag earlier. When searching for canvas bags, you’ll find that there are a lot of options to choose from. While every bag is different, we’re talking specifically about cotton bags, which makes your choice a lot easier. Size: You need to consider the size of the tote. If the tote is too big or small, it’s not for you. Always choose a size that is a little larger because cotton does tend to shrink when washed. Washable: A washable tote is a great choice, and spot cleaning is another must-have. Totes and bags will get dirty, and if you have to throw them out because of them being dirty, it’s contributing to the problem. Washable bags are the way-to-go. Thickness: The thickness of the bags need to be considered, too. If the bags are too thin, they won’t be able to withstand heavy loads. I recommend a cotton bag that has a 10-ounce thickness. Handles: Some bags need to be “hugged” and carried to their destination – it’s not fun. The ideal bag will have handles that allow them to be carried and transported with ease. The size of the handles are up to you. Otherwise, there’s not much that goes into these totes. If they’re heavy enough and have handles, they’ll be much better than using paper or plastic bags. 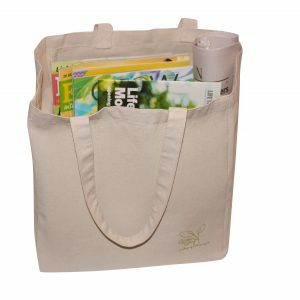 Canvas Bags offers an eco-friendly, reusable bag that’s a natural canvas tote. The tote is sustainable, and you have the option of purchasing one or three totes; I recommend buying three since you’ll have more than one bag of groceries in most cases. These canvas tote bags can be used for just about anything: Magazines, books, computer tables, etc. Anything you want to “tote” along! Natural and neutral in color, the Natural Canvas Tote never goes out of style and is super easy to clean. You can spot treat any stains that end up on your tote. If your tote has a major stain or needs a better cleaning, throw it in the washer. What I do want to mention is that cotton shrinks when washed. So, after your tote’s first wash, you can expect it to shrink somewhat. This won’t be too noticeable, but it’s something to keep in mind when making your purchase. All cotton has a tendency to shrink at some point. When you place the tote on your loading surface, you’ll notice that the sides stand up on their own. The sides are able to stand on their own thanks to the gusseted design. 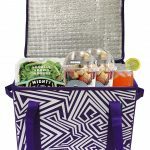 This makes it much easier to load up your groceries or other items into your tote. But as the tote starts to be used more often, the cotton will begin to soften and this will stop the bags from being able to stand upright. There’s little you can do to restore the fresh creases and help your bags stand up properly again. Each tote weighs a mere 6.6 ounces, so they’re very lightweight in design. My only complaint – if you can call it that – is that the cotton of the tote will shrink. When you wash your tote, you’ll often find that it shrinks to a much smaller size and may become disfigured as a result. A lot of people will actually iron their tote when it comes out of the wash, and this seems to help restore the structure of the bag to some degree. If you try these totes, you’ll love them. Totes provide you with a reliable way to carry your groceries and other items without worrying about wasting and impacting the environment with plastic bags. Reusable, you’ll even save some money at the grocery store by supplying your own bags that are much sturdier than plastic or paper bags. Click here to order your eco-friendly grocery tote bags today. These are the best reusable grocery bags you can buy. 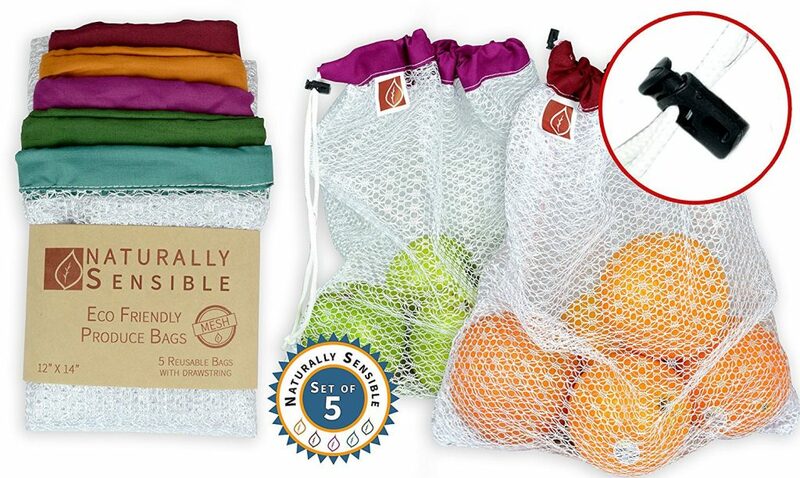 I couldn’t help but recommend another great product that goes great with your totes – Naturally Conscious’ produce bags. These are eco-friendly, washable bags that have a nylon mesh and comes in a set of five. There are five different color options offered in the set, too. One bag has more than enough room to hold six big oranges, so there’s ample room for all of your produce. Click here to order the eco-friendly produce bags today. 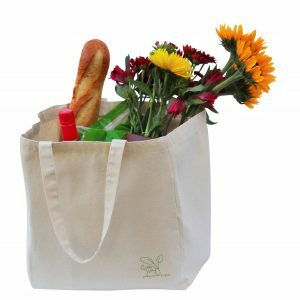 If you want the best cotton canvas bags for grocery shopping, the Natural Canvas Tote provides you with a 100% cotton, reusable bag that’s washable, durable and reliable. Anyone who wants to save money (just a few pennies) and not contribute to landfills that are overflowing with plastic bags, totes are a great option.